Make plans to be a part of the Ministry Fair on October 28 from 9:30 a.m. – 12:30 p.m. in the Gym. 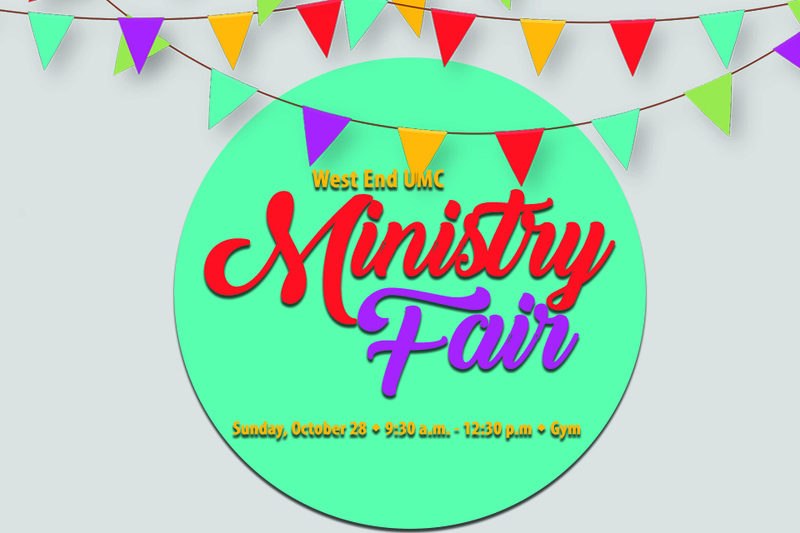 The Ministry Fair is an opportunity to share and learn about the multitude of ministries at West End UMC. The Committees, Ministries and Sunday School classes of the church will host tables at the Fair, and all members and visitors are invited to come learn about them. If your class, committee or group would like to have a table at the Fair, please resgister below by September 30. The Lay Leadership Committee will provide wall signs and a map for the Fair, as well as light refreshments during the Fair. You will want to think about what eye-catching resources (e.g., tri-fold presentation board, pamphlets, hand-outs) and possibly treats you’ll want to have at your table. Even if you don’t host a booth, mark your calendar to come join the fun and fellowship at the Fair!